There are 29000 rhinos left in the world and South Africa is home to 75% of them. Rhino poaching has increased dramatically in the last few years and hundreds are being killed each year for their horns. These horns are highly prized in traditional Asian medicine, where it is ground into a fine powder or manufactured into tablets as a treatment for a variety of illnesses such as nosebleeds, strokes, convulsions, and fevers. Their horns sell on the black market for more than $60000 per kilogram. This demand has created a highly profitable and organized international poaching syndicates who deploy advanced technologies ranging from night vision scopes, silenced weapons, darting equipment and helicopters to carry out their mission. If it is not stopped, the world could lose African rhinos. "This is a tragedy we do not want to contemplate.” Dr Joseph Okori, Head of WWF’s African Rhino Programme. Despite abundant petitions and awareness campaigns, the numbers of our rhinos killed continue to soar. South African government needed to find a way to talk directly to those responsible for creating the demand and show them the impact of their actions. Thus emerged this idea of using postage stamps to communicate to people across the borders. The usual breathtaking imagery of African animals in the stamps were replaced by the carnage that poachers leave behind. 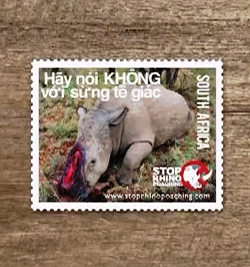 Each stamp included a message in Chinese, Vietnamese or Thai reading: "say no to rhino horn." They created a way to take the fight against rhino killing to those who were responsible for this demand. They then used these designs to create posters that were put up countrywide, rallying the South African pople to attach one to all letters leaving the shores to China, Vietnam or Thailand. They also created stamp booklets that were handed out to be used as inserts and direct mailers. This made sure that each and every stamp sent became a direct mailer from the South African citizens to the citizens of China, Vietnam or Thailand. More info: “Rhino horn is largely made of keratin and will do nothing to treat cancer or help one’s sexual prowess. There are traditional medicines that have proven to be effective for treating a variety of ailments and symptoms and have saved millions of lives. Rhino horn is not one of them” said TRAFFIC’s Greater Mekong Programme Coordinator, Dr Naomi Doak. 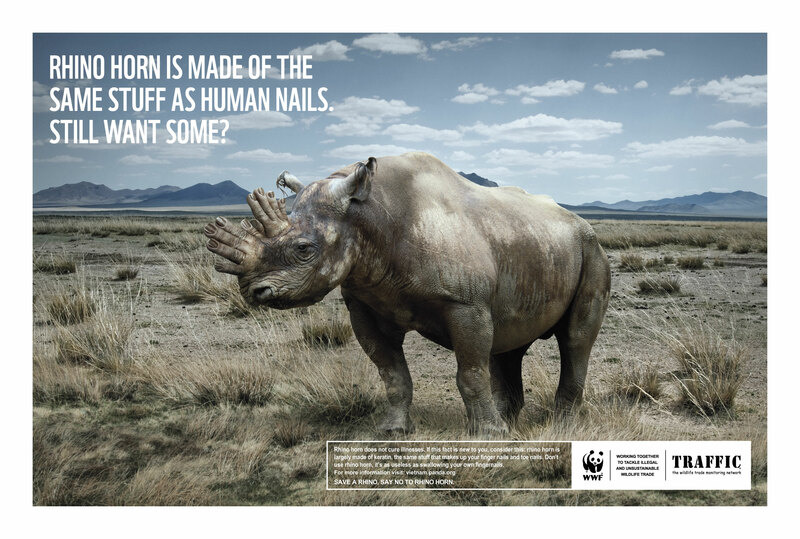 “Widespread lies, myths and rumours are fuelling demand and use of rhino horn.” Vietnamese citizens are being encouraged to stop buying or consuming rhino horn through a series of advertisements like the one below by WWF and TRAFFIC as part of their campaign against Illegal Wildlife Trade.